Our staff has over 50 years of experience with the design, installation and operation of a wide variety of treatment systems. Embarking on the installation of a treatment system is not to be taken lightly because of the cost, time and property disruption that can result. For that reason, we always evaluate other options first. Once it is clear that a treatment system is needed, the proper remedial options must be selected and configured to meet any unique features of the property, the sensitivity of the location and the goals of the client. Bio-RemOX SM: LEI's patent pending, revolutionary remedial technique combining Chemical Oxidation with Bioremediation. Bio-RemOX SM is performed by self contained and self sufficient mobile injection units. Air Sparging: Introducing pressurized air to groundwater at low flow rates to encourage the volatilization of dissolved phased contaminants. 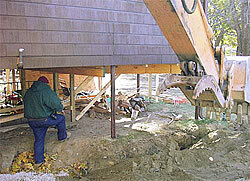 This technique is frequently employed in conjunction with soil vapor extraction and/or bioremediation. Dual Phase Extraction: A modified version of soil vapor extraction that utilizes a high vacuum capable of extracting both vapors and groundwater from the same well point. This technique is effective at sites that exhibit free phase contaminants or NAPL (Non Aqueous Phase Liquid).